Dr. Jyothi Bhatt will lecture on the benefits of the ancient chakra system as a complementary diagnostic tool at the eighth annual mind/body medicine CME conference October 25-29, 2016 at the Cranwell Resort and Spa in Lenox, Massachusetts. Entitled American Meditation: The Heart and Science of Yoga, this 30 credit hour training is accredited through the Albany Medical College Office of Continuing Medical Education. As a diagnostic tool, ancient Ayurvedic principles can reveal important physical, physiological, psychic and behavioral characteristics that lead to stress-induced burnout. Dr. Jyothi Bhatt holds a Bachelor of Ayurvedic Medicine & Surgery (BAMS) from the Shri Dharmasthala Manjunatheshwar College of Ayurveda in Kuthpady, Karnataka, India. 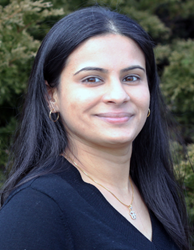 She is currently a Physician’s Assistant at the NewYork-Presbyterian/Weill Cornell Medical Center and a faculty member of the Kripalu School of Ayurveda. “The Heart and Science of Yoga®” conference offers comprehensive training in the world’s most effective holistic mind/body medicine and its scientific foundation. With fewer than 75 physicians attending, the program is designed to encourage active participant interaction by combining engaging lectures, practicums, panel discussions and Q&A. Although recent studies have demonstrated that 75% of health care costs associated with chronic diseases could be prevented or reversed by lifestyle changes, many clinicians do not offer themselves, or their patients, strategies that encourage meaningful change. AMI’s CME conference will provide easy-to-learn practices that work synergistically (within the intricate medium of the stress system) to reduce inflammation, allostatic load and burnout while working toward establishing homeostasis. The devotion, enthusiasm, and teaching methodology of the entire AMI faculty will combine to create a dynamic and interactive course for healthcare professionals. Each AMI faculty member is committed to the advancement and training of Yoga Science as holistic mind/body medicine. In addition to Dr. Bhatt’s lectures on Ayurveda, presenters include program director Leonard Perlmutter, AMI founder, meditational therapist and award-winning author; Mark Pettus MD, Director of Medical Education and Population Health at Berkshire Health Systems; Anthony Santilli MD, board-certified in Pulmonary and Critical Care Medicine; Prashant Kaushik MD, board-certified Rheumatologist; Sara Lazar PhD, instructor in the Department of Psychiatry at Harvard Medical School, and an Associate Researcher in the Psychiatry Department at Massachusetts General Hospital; Susan Lord MD, a private practice holistic physician focusing on prevention and treatment, and former course director for the The Center for Mind-Body Medicine’s “Food As Medicine” program in Washington, DC; Jesse Ritvo MD, Assistant Medical Director, Inpatient Psychiatry, University of Vermont Health Center; Beth Netter MD MT, holistic physician and acupuncturist, Albany, NY; and Jenness Cortez Perlmutter, faculty member of The American Meditation Institute. The American Meditation Institute (AMI) is a 501(c)3 non-profit educational organization devoted to the teaching and practice of Yoga Science, meditation and its allied disciplines as mind/body medicine. In its holistic approach to wellness, AMI combines the healing arts of the East with the practicality of modern Western science. The American Meditation Institute offers a wide variety of classes, retreats, and teacher training programs. AMI also publishes “Transformation,” a quarterly journal of meditation as holistic mind/body medicine. Call 518.674.8714 for a postal or email subscription.